Costa Rica News – INS asked the court to begin the process of collecting “marchamo” immediately, but the court did not accept the request. The judges instead gave the Superintendency of Insurance (Sugese) two days to present its version. The 2019 marchamo should be collected starting today, November 1, but it is stalled indefinitely until the court can close the case. There is no security as to it being a quick case or as to when it may finish. The marchamo is the right for vehicles to circulate. 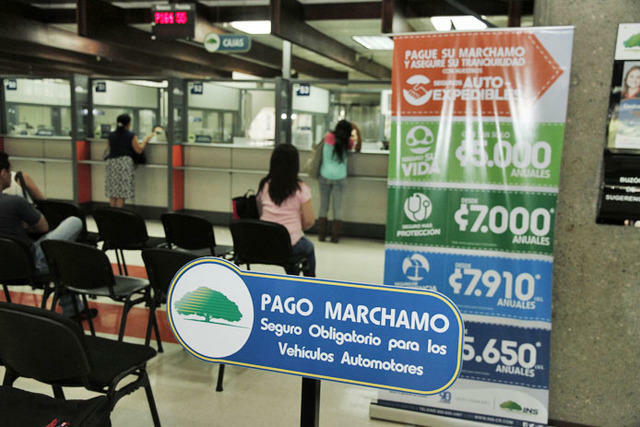 1.5 million vehicles are charged annually in Costa Rica. INS requested back on September 20th that the rate remain the same as in 2018, leading to a clash with Sugese. The compulsory payment last year was ¢21,380 for cars, ¢70,415 for motorcycles, and ¢61,900 for taxis. If the court sides with INS, within 24 hours of the determination the collection could begin.